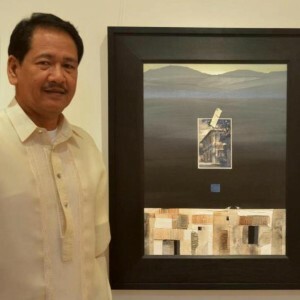 Fidel Sarmiento’s interest in colonial houses stemmed from his initial college work while taking up an architectural degree course at MAPUA Institute of Technology. After one year, he found out that architecture was too linear and too technical in its approach to drawing. He realized that he was fascinated with the vintage appeal of period houses, more than the logic of the structure. He readily shifted to a fine arts course in painting at the Feati University. Enjoying a university scholarship, he was armed with pure essence in what was to become his art. His fascination has brought him to various places where large settlements of old houses abound. Their collective charms allure him. These places are living dioramas where the rich colonial past dialogues robustly with the forward-moving present.